Almost every feast in the Sarum calendar has a sequence. This is no exception. On this bright day the festive band gives praise / And in sweet concert calls on Mary's name. And here you can see the incense put into the thurible, again by the Deacon, the Deacon's blessing (facing south), the censing of the Text on the altar, the procession, the announcement of the Gospel (all clergy turning to the altar for Gloria tibi Domine), and the singing of the Gospel. You'll note that the Deacon does not sing from the Text, but the Subdeacon stands holding it open anyway to his left. At the end he kisses both books. The celebrant immediately intones the Credo. The procession returns to the altar and the Celebrant is censed—there was a complicated bit of detective and deductive liturgical work we had to do here. I'll post the whole Credo on the next clip, so you don't get annoyed at having it cut off. Father I was present at that mass, and remember it well! Do you know of Sarum rite celebrations in the future? Catholic ones—I don't know. Such things are very rare. More frequently the CofE celebrate with Sarum ritual. I am so happy that you are back to your blog. I was very sad when you suddenly stopped posting. I have a question: would it be possible to gain an indult to celebrate the Sarum Rite? I am curious, Father, as to why you prefer to refer to the Mass as said in Salisbury as the "Sarum Use." This curiosity is due to the fact that a while back, there were people over at the NLM who were *very* obstinately defensive on referring to it as "Rite,' instead of "Use." Michael: The legal position of the Sarum Use needs clarifying. I am of the opinion that, being considerbaly older than 200 years at the Council of Trent, it needs no permission or indult for celebration in the British Isles. This conclusion was reached in the early years of the 20th Century when they revived the Use of Braga. However, ten years ago, a flunkey at the Congregation of Rites came to a different conclusion, (with which judgment eminent liturgists have disagreed). Despite the agreement of these eminent liturgists, I have not celebrated Sarum since—I am, after all, a Catholic—and I would like this matter to be formally clarified. There may well be a different spirit in the Congregation of Rites these days if you wish to take the matter up with them. It was always explained to me that Sarum is a use (or custom) of the Roman Rite. I think, as a rule of thumb, if it's got the Roman Canon it's a Use of the Roman Rite; others may disagree. 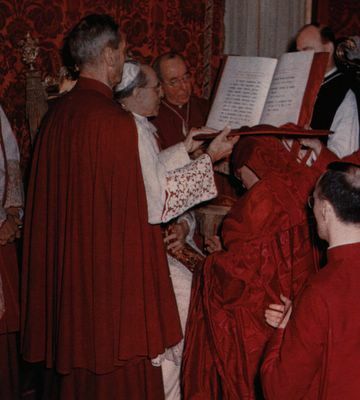 If Vatican flunkeys want to prohibit the Sarum Use, I think they would need to prove that it has been abrogated, which it certainly wasn't by Pius V or Paul VI. Of course, here in York we had (have?) our own use. The books and the music are all still extant, but again it is only the Anglicans who have attempted to revive it for Eucharistic celebration. I have sung Sext according to the York Use with my Schola at Leeds Trinity & All Saints, and I think Mary Berry did a Vespers some years ago.